Watching the intriguingly titled wartime drama For Those in Peril, I was left with the impression of a detailed sketch for a film rather than a finished work. The traditional elements are certainly all in place – key characters are introduced, their situation established and their lives then threatened by enemy activity. What's missing is the personal drama, the sort of engagement with the characters that should have us chewing our fingernails for their fragile wellbeing. This is the WW2 sea story stripped to its essentials, a template on which to build, perhaps, but a solidly executed one with its own specific areas of interest and merit. A brisk prologue establishes the fate for air force pilots who are shot down and land in the drink in 1940 when one of them dies before the nearest lifeboat is able to locate him. Four years later and the RAF have established the Air Sea Rescue Service, a unit equipped with small but fast-moving boats whose principal task is to locate and rescue air crew brought down over the English channel. Freshly transferred to the group is Pilot Officer Rawlings (Ralph Michael), a former flyer grounded by an unspecified medical issue who's just a little cynical about the worth of his new role. Taking him under his wing is Commanding Officer Murray (David Farrar, who four years later would really make his mark in Powell and Pressburger's superb The Small Back Room), who shows him the ropes and provides the odd pep talk to get him on track and encourage him take the importance of his post more seriously. Rawlings' attitude problem isn't helped by an incident-free first sortie that ends with him sunbathing on the beach and the crew swimming cheerfully in the harbour. Their next trip out proves a very different story. Structurally this is standard stuff, with Rawlings from the start set up to have his indifference shaken by experience. 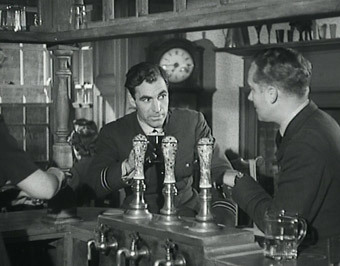 There's a cyclic aspect to the plot built around a Folkestone bomber crew that Murray and Rawlings first meet in the local pub, which provides a tidy final encounter for the latter's inevitable transformation from sarcastic glory-dreamer to committed Air Sea Rescue officer. But in terms of character detail that's about as far as it goes. We learn little about Rawlings and make no real emotional connection with either him or the thoroughly decent and otherwise likeable Murray, solid skeletons of characters that have yet to be fleshed out with interesting detail. 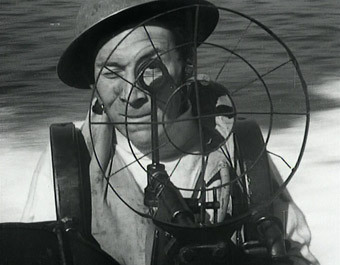 Of the crew themselves, only the cheery Wilkie (the ever-reliable John Slater) is given the sort of background and character detail required to make his character more three-dimensional. His former career as a hearse driver also provides some surprisingly near-the-mark dialogue for the time – ribbing a colleague about his upcoming date with a local girl, Wilkie tells him "I'll bet I've had more females in the back of my old bus than you ever will, all of 'em horizontal too." The entendres continue with the swimming crew members ("We've only come to scrape the barnacles off your bottom!") and Murray's supplied reason for turning down a drink offered by a startled airman unaware that he is referring to his boat: "I must get back to Sally. I've got to introduce her to this chap. Make sure she's tied down and not rolling." All this is build-up to the character-transforming mission, which occupies the entire second half of the film's brief running time. It's workmanlike stuff in the best sense, tossing three of the Folkestone crew into a dinghy in heavily mined waters and fog and with a big German ship near enough to cause trouble for any rescue attempt. Director Charles Crichton builds some real tension here, but oddly drops the ball when the rescue craft has to make its way through the mine field directed only by Rawlings' hand signals, a sequence that could have been a real nail-biter had it lost the dramatic music score and not been in such a hurry. When the chase is on the pace is brisk, however, and the speed of the boats is vividly captured by some striking close-to-the-water shots of the bow tearing a gap through the surf. For Those in Peril is an solid and unfussy war story whose key purpose was likely to raise public awareness of the work of this unsung branch of the forces. In this respect there is inevitably some hero building and openly expressed mutual respect, but it's done with typical (and frankly pleasing) British reserve, and is given a down-to-earth edge by a drama-documentary element that does not guarantee the safety of any of the cast once the shells start flying. In some respects it plays like a blueprint for the 1954 take on the same set-up, The Sea Shall Not Have Them, whose characters have more depth than their equivalent here, but For Those in Peril still has its moments and has a nice line in dark and deadpan character humour – as the three downed airmen wait anxiously for rescue, the injured one of the party says, "You know, I've often dreamt I should die from being shot in the back," to which his companion responds without a blink, "You aren't, you're shot in the front." The print here shows its age a little, as even after a clean-up there are plenty of dust spots and a few scratches and other assorted damage on show, though the incorporated documentary footage of planes and ships tends to come off worst here. There's also a trace of picture instability in places, though nothing too distracting. In other respects, though, this is a pleasing transfer, as while the contrast and brightness vary a little, for the most part they're stable with a decent range of greys and solid black levels. Detail is consistently good. The dynamic range of the Dolby 2.0 mono soundtrack is restricted, as you'd expect, but is otherwise surprisingly clean and damage-free, and the music is clear enough within the range restrictions. Nothing here. A bit of a shame, really – some info on the filmmakers or the Air-Sea Rescue unit and their work would have been welcome. An efficient blend of drama, documentary and public information film that's a bit light on character and fumbles a golden opportunity to create some serious drawn-out tension, but remains interesting and enjoyable nonetheless, especially at this running time. Given that the film is not much over an hour and there are no extras, whether Optimum's DVD represents value for money can be questioned, but the film itself is going to be of serious interest to British cinema and particularly Ealing enthusiasts, not least for the roll call of filmmakers involved in its production. Produced by Michael Balcon and directed by Charles Crichton, it was co-written by T.E.B Clarke (he of Dead of Night, The Blue Lamp, The Lavender Hill Mob and The Titfield Thunderbolt, amongst others), J.O.C. Orton (Oh, Mr. Porter!) and Harry Watt (The Overlanders, Where No Vultures Fly), while the exterior photography was was the early work of future Oscar winner Douglas Slocombe.